That’s a question that’s been posed millions of times online and in life. Little do the inquiring minds know that it’s a trick question, because all the abdominal training in the world doesn’t matter if you have a layer of chub covering them up. To burn that adipose tissue and reveal the abs beneath, there is no substitute for dieting—not just “eating well,” but eating for a very specific goal. I’ve explained this to many a man yearning to show off a six-pack, and nearly all assured me, “I eat pretty good.” I imagine only a few of them were outright lying. The remainder were simply ignorant of just how they truly needed to eat if the goal is taking bodyfat levels down to the point where the abs stand out in bold relief. Most of us who work out do eat better than the average person, to be sure. Yet there is a vast difference between eating to be fit and eating to be ripped. Let’s walk you through it. The most significant distinction between those who eat well and those who have everything dialed in tight? How often they eat. While the academics sit back and debate whether eating every 2-3 hours each day actually does anything to “speed up” the human metabolism, the vast majority of bodybuilders just know that this approach works. Why? For one, it gives you control over your food, rather than letting your circumstances control you. And if there’s any better way to meet an ambitious daily protein number, I haven’t discovered it. I’ve heard this too many times to count. And yes, you can. It just takes planning and preparation. You will need to compare prices, shop for the increased amount of food, learn how to prep it, then cook and store it in multiple servings. And those are all timeless skills worth learning as early in your lifting life as possible. Most bodybuilders and serious lifters will meal prep once or twice a week, baking and grilling all their chicken, turkey, fish, and lean red meat, as well as preparing their carbohydrate sources in bulk, such as baked potatoes and rice. Make no mistake, it’s work. And work is what it takes to remove a significant amount of body fat. If anyone ever tells you it’s possible to get extraordinarily lean without any hard work or suffering, they are either lying through their teeth, ignorant, or trying to sell you something. 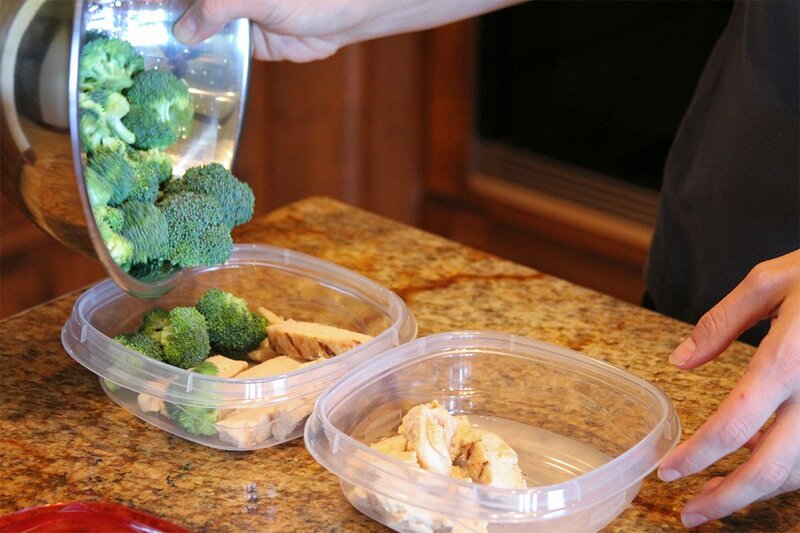 Start cooking now if you want to show off a six-pack! A vast amount of people out there mistakenly believe they are eating “clean,” when they’re miles away from it. For instance, two people can have chicken for lunch. One of them is eating a 6-ounce grilled, skinless chicken breast, perfectly seasoned but otherwise unadorned. The other is eating a chicken sandwich from a fast-food restaurant, deep-fried and slathered in mayonnaise, served on a bun. Let’s do a little comparison. It should be obvious that the nutritional profile of the chicken breast is vastly superior to the fast-food chicken sandwich. The chicken sandwich has more than twice the calories, more than five times the fat, and a pathetic 40 percent of the protein! Compared to the freshly-cooked chicken breast, the sandwich is garbage. Yet a lot of people will justify it as a healthy choice, because relative to, say, a double cheeseburger, it probably is. Eating from these places on any sort of regular basis will prevent most people from ever seeing bodyfat levels low enough to clearly display the abdominals. If you want to get strong, feel fit, and look OK, you can include something like this in your diet…sometimes. But if you want results you can see, you need to kick it to the curb for the time being. The other major difference between the level of clean eating required to see clear muscle definition as opposed to just looking “fit” is that there’s no room for error. You can quickly sabotage a six-pack diet with extra calories, fat, and sugar in the form of condiments, sauces, and dressings. Nowhere is this clearer than in salads. Millions of people assume that a salad is a supremely healthy meal choice. 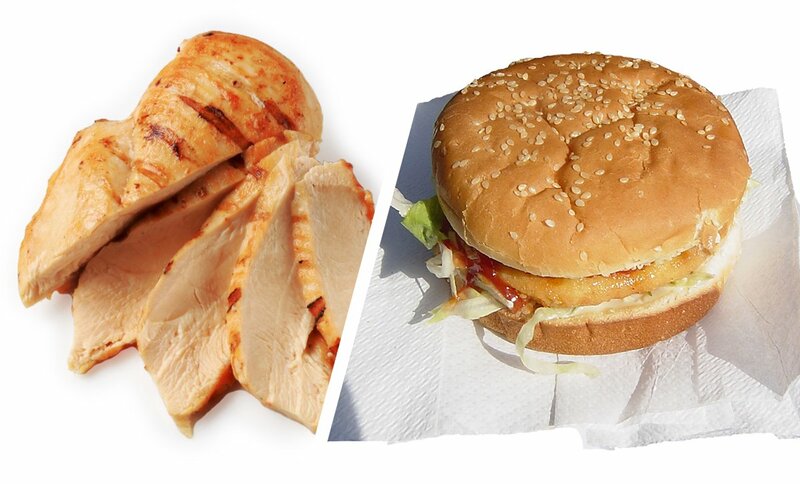 Just as with that chicken breast versus a fast-food chicken sandwich, there is a world of difference in what you opt for. For example, take the same tossed green salad. If you flavor it with 2 tablespoons of balsamic vinaigrette, you only add 15 calories and 0 grams of fat. If instead you dump a quarter-cup of Caesar salad dressing on it, as many people do, you just added 310 calories and 32 grams of fat! It’s easy to see how that would hamper anyone’s efforts to shed bodyfat. Other people dump ketchup all over everything they eat, or drown their healthy proteins in barbecue sauce, not realizing that their once-healthy meal is now doing more harm than good. Are you supposed to eat everything bland and without flavor? Of course not! 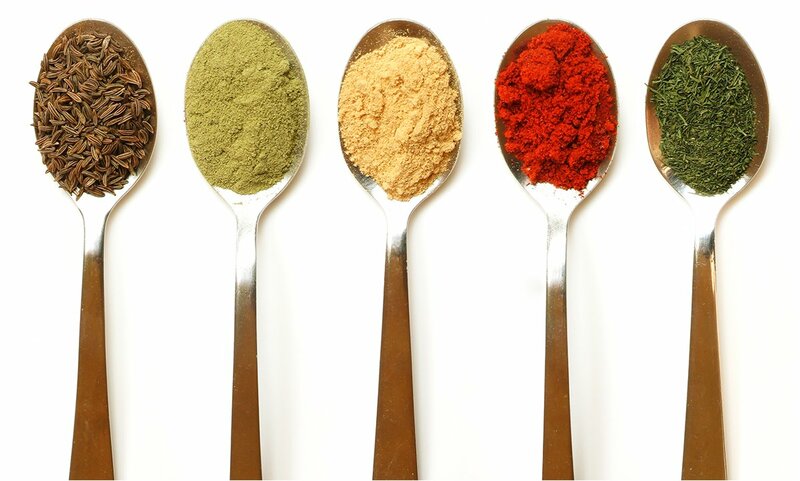 Start learning about spices, seasonings, and marinades. These are much cleaner choices and, once you know what you’re doing, they can be every bit as tasty as sauces and condiments. If there’s one ridiculous concept that’s unfortunately been ingrained into the collective consciousness, it’s that training goes hand-in-hand with “cheating.” Even those with very large amounts of bodyfat to lose somehow believe that they are entitled to one or more totally unrestrained junk-food meals every week—or even every day—if they are following a strict diet. If you can’t see even a blurry outline of your abs and you crave that washboard appearance, trust me: You have no business rewarding yourself with a pizza just because you ate well for a few days. All you are doing is taking steps back from your goal. Learn to cook better-tasting food, stay the course, and keep eating clean until the fat is gone! Those of you who like to indulge in alcohol on a regular basis need to know that it’s completely at odds with ever seeing clear abs. There is a reason it’s called a beer belly! A 12-ounce bottle of Corona gives you 149 calories and 14 grams of carbs. That’s more or less harmless on its own, but do the math and you’ll see that if you’re going through a six-pack of those, it’s enough to wreck a day of eating. And a few wrecked days in a short time period is definitely enough to keep you from getting a six-pack set of abdominals. 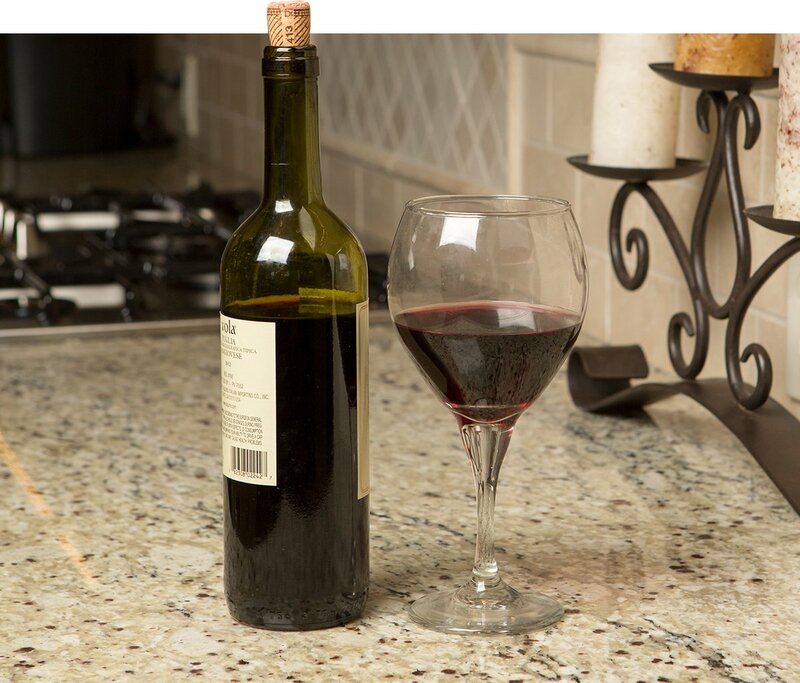 Wine or mixed drinks, especially those containing fruit juice, can be even more laden with sugar and calories. No one is saying you can’t have a glass of wine or a bottle of beer every now and then, but if you go out and get hammered every weekend, rest assured that you are not going to be the lean, mean, beach stallion you could be if you didn’t. Everything I’ve touched on here can be summarized in two words: patience and control. Those are the skills that make great lifters in the gym, and they’re what sets them apart in the kitchen. Do you have to listen to me? Nope. But if you want to be one of the few truly lean guys or girls strutting around and displaying a degree of muscle definition that sets you apart from the herd, then try eating this way for six weeks. Then see if you turn back. I’m pretty sure you won’t.